The Angriest: Star Trek: Voyager: "Lifesigns"
It is 26 February 1996, and time for another episode of Star Trek: Voyager. Voyager encounters a Vidiian transport with one passenger - a critically ill Vidiian doctor named Danara Pel (Susan Diol). With a neurological implant about to fail, the Doctor (Robert Picardo) transfers Pel's brainwave patterns to Voyager's computers - and creates a holographic body for her to use while he can stabilise her real one. While he cares for her, the Doctor begins to experience romantic feelings for the first time. "Lifesigns" sees Voyager in classical Star Trek mode, with the Doctor - a character inexperienced with the human condition - experiencing a human emotion for the first time. Much like the Star Trek: The Next Generation showcased Commander Data's first romantic relationship, "Lifesigns" undertakes the first experience of love for the Doctor. It may be a re-used concept, but it still works very well. 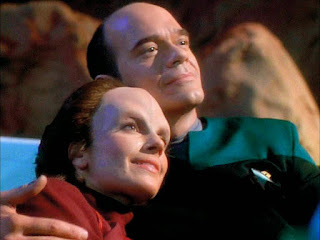 It is easy to see Robert Picardo in the series, week in and week out, and overlook just what an excellent asset to the series he is. He is not often required to do much but be curt and grumpy, but when an episode allows him to stretch the character he honestly does wonders with it. He visibly has a lot of fun playing a confused and anxious simulation navigating feelings that he was simply never designed to have. He may have learning algorithms, but he was also designed to be used briefly during emergencies. Meeting aliens and falling in love with them simply isn't part of his programming. The romance also works because it matches Picardo so well. Susan Diol gives Danara a dignity and an intelligence. Her situation is quite heartbreaking: her species is dying out from an incurable disease, and extend their fragile lives by grafting tissue from other species to their own bodies. As a hologram Danara is a healthy woman, but inevitably she will be forced to return to the patchworked shell that is her real body. A sense of regret is layered over the whole episode like a subtle tension. Often Star Trek romances are ineffective and a little tedious. That certainly is not the case here. Elsewhere, Tom Paris (Robert Duncan McNeill) continues to act out and rebel against Commander Chakotay (Robert Beltran), while Ensign Jonas (Raphal Sbarge) continues leaking secrets to the Kazon Nistrim. It is all part of an extended subplot that runs over several weeks, but it is really beginning to outstay its welcome. Thankfully it wraps up in the following episode. Despite the annoying subplot, "Lifesigns" is another win for Star Trek: Voyager's second season. With 12 good episodes out of 19, the quality ratio rises to 63 per cent.